The final week of excavations in Area 1 yielded interesting information about the building’s history. First, up to now, we had found three destruction layers—one from the Roman period and two from Minoan times. The first Minoan layer was discovered in Sectors II, III, and IV. The second, in Sector II, contained not only at least six fruit stands and one kyathos bowl, but also one wall, which we called A, that extends parallel to the north wall and occupies most of the north side of Sector II. Wall A belongs to a Minoan phase older than the one in which the north, west, and south wall of the building were built. We believe that another wall, B, runs beneath Wall β, since we found at least four slabs in a row (and gray-colored slabs of Wall B lay beneath Wall β). Wall B dates to Minoan times and must be contemporary with Wall A. Although the excavations this final week have taken place mostly in Sector II, research also continued in Sectors III and IV, where we at last reached the bottom of the Minoan destruction layer. Finally, in Sector I, we found one more wall, which begins at the north wall but never terminates at the south wall. This wall we named δ. The excavation of the Mycenaean site at Mnimata proceeded with minor work in Trenches 1, 3, and 5. From the latter, we removed the remains of a pithoid jar, trapped by fallen stones, and a fragmented cooking vessel. At the same time, we further excavated the large square cornerstone and the adjacent walls to get rid of the (obviously) fallen stones. Then, we proceeded to reveal the room, which takes up most of Trench 5. We found large stones that look like a bench alongside the north wall. Among these, we unearthed part of a large cooking vessel, most probably the same one as in Trench 5. Trench 2 demanded most of our attention this week. After excavating the pottery from the central and northeastern parts of it, we removed schist slabs to continue digging beneath them. As expected, we kept unearthing pottery. However, this time, there was a significant difference: in contrast to the large, coarse cooking and storage vessels of the upper level of the accumulation, we discovered finer pottery, such as cups and stirrup jars. In addition to the stone finds from last week, we excavated even more, of several shapes—globular, discoid, and formless—in the central and southwestern parts of the trench. A stone with a shallow, round cavity, perhaps used as a mortar, was brought to light, too. There were also some clay objects, probably spindle whorls, and a bronze tool that looks like a small chisel. These finds change the impression we had of the room last week. We thought that it might be a kitchen. Now, however, we believe it may have been a workshop or a multifunctional room. While this summer’s excavations were underway, our conservator Myros Nikakis restored a large pithos that had been found at Zominthos during excavations in the 1990s. The jar will be exhibited in the museum of Anogia on Crete, which is under construction. Also, all the other fragmentary vessels found during the early excavation were washed, dried under the sun, and then restored. 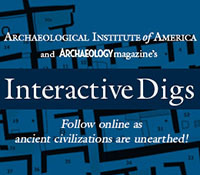 During the 2010 excavations, team member Constantinos Papadopoulos, in collaboration with the dig’s directors, produced a virtual museum model with finds from the Ceramics Workshop that was unearthed in 1989. Since there is not an official exhibition space and the archaeological data from this room has not yet been published, we decided to create a digital museum where visitors can see the various finds, along with pictures from the excavations. Very soon, it will be presented on the official Greek site of the excavation, www.zominthos.org. This entry was posted on Thursday, November 11, 2010 at 11:15 am	and is filed under Field Notes 2010. You can follow any responses to this entry through the RSS 2.0 feed. Both comments and pings are currently closed. They should be doing this in Ireland every day,instead they build motorways on top of our ancient past, sad stuff. Great site this,well done. Thanks a lot for your comments. Greek archaeology has lots of problems as well, but we are trying to do our best. Zominthos Team: My family and I will be in Kriti in mid-June and would love to visit you and your site. Please let me know if this is possible and if so, who I should contact regarding a site visit. I am an archaeologist specializing in Northeastern American pottery. We have been following your work and would love to see it first hand. Please accept our condolences on the passing of Professor Yannis Sakellarakis. I’m sorry for the delay of my reply. In June the excavation will not have started but you can still visit the site. Just ask for Mr Vassilis Fassoulas, the guard of the site, at the Anogeia village and he will take you to see it. Thank you for your condolences and for your interest in our excavation. Thank you for your reply to my request for a site visit. My family and I are preparing for our visit to Kriti and hope to be able to see your site. Best Wishes for a good dig in the coming season.